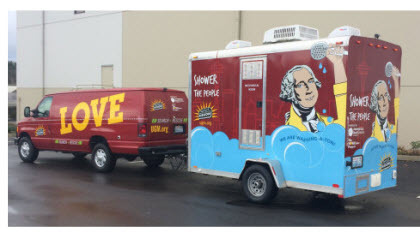 They are calling Seattle's first mobile shower unit Shower the People – a take-off on James Taylor's song "Shower the People [with Love]. It will start out serving about 30 residents at the Camp Second Chance encampment once a week and there are plans to expand to other homeless communities. Residents will be able to take a 15-minute hot shower and receive clean dry towels, shampoo, conditioner and soap. The unit can provide up to 30 showers, two at a time, before it needs to be refilled with water. Three local agencies are partnering on the project, Seattle’s Union Gospel Mission, Amerigroup, and The MORELove Project. "This collaboration will allow our outreach team to offer a new, needed service at some of these encampments and build further relationships with those in greatest need," said Jeff Lilley, president of Seattle’s Union Gospel Mission. The all-female team of high school students are among 15 teams of young inventors to receive $10,000 grants from the Massachusetts Institute of Technology. The Lemelson-MIT InvenTeam Grants give high school students an opportunity to use technology to solve real-world problems. According to a CBS Los Angeles report, the San Fernando High School students built the tent intended for use by homeless people with everything from insulated fabric and solar panels to a safety locking system and a UV system to sanitize it. In what the Herald Sun calls a national first, RMIT University in Melbourne has named Guy Johnson, to head the school's new Urban Housing and Homelessness program. Johnson began working at an agency serving the homeless in the 1990s, eventually leaving social services to pursue a PhD at RMIT. The program Johnson is leading is a partnership with Unison, a housing organization. The goal is to focus on causes of homelessness and preventive measures. “Since 2011, the number of people seeking help from homelessness services has been increasing by an average of 6% a year, which is much faster than population growth,” Unison CEO Michael Perusco told the Herald Sun. A Single-Room-Occupant (“SRO”) Renewal Initiative in downtown Vancouver, BC is now complete and the 13 renovated buildings will provide 900 supportive housing units for some of the city's most at-risk residents. Ameresco Canada led the construction responsibilities. The public-private partnership between British Columbia Housing Management Commission (BC Housing) and a consortium led by Forum Equity Partners is being hailed as a model for future projects. "The public private partnerships model allowed for an innovative approach to developing a cost-effective housing project, which created significant value for the community, government agencies and companies involved," said Rupesh Amin of Forum Equity Partners. The Province of British Columbia invested $143.3 million into the project, which included $29.1 million from the Canadian government through its P3 Canada Fund. The Coalition on Temporary Shelter (COTS) in Detroit provides a variety of services for homeless families, including helping connect the homeless women it serves with jobs. As Delphia Simmons, a Detroit Revitalization Fellow at COTS tells CityLab, to get people back on their feet, they need to do more than just house them. Among other efforts, COTS partners with a few local businesses that offer paid training programs. One example is Ruby Nell, a company that makes jewelry and has employed about 12 women from COTS, paying them hourly wages and reinforcing lessons in financial literacy that COTS provides. From apps to arms to spendy cleanups: Is there a right way to handle homeless camps?